Alternative rock quartet Papa Roach just revealed their new Who Do You Trust? album, through E7M (Eleven Seven Music). With over 10 million streams globally, the song currently sits in the Top 15 Active Rock U.S. radio chart. 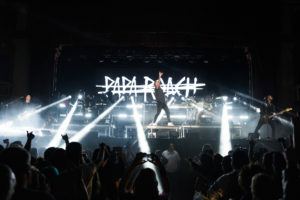 Having just completed a successful, SOLD OUT tour with Shinedown and Asking Alexandria in the U.S, Papa Roach announces seven new dates to their summer U.S. tour in August, featuring guests Asking Alexandria and labelmates Bad Wolves. Additional shows in Charlotte, NC (Aug. 4), Bethlehem, PA (Aug. 13), Cleveland, OH (Aug. 18), Denver, CO (Aug. 24), and Los Angeles (Aug. 31).